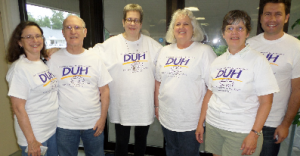 In September of 2013, the original DUH-sters set off on our first tour. Ryan drove Sue's car from Chicago to Augusta, Maine and Bob and Doris drove from Detroit, and everyone else flew, meeting up in Maine. Nine cities in 11 days and more great activists met, audiences informed, and many lessons learned! Laurie and Terry met Sue at the Portland, Maine airport with one of the signs they'd had printed. 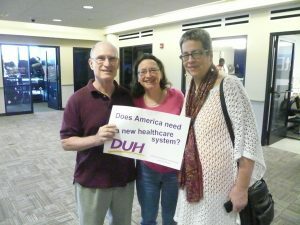 Activist extraordinaire Julie Keller Pease took us to lunch and laid out the itinerary - a press conference with the authors of Maine's single-payer bill, and then filming of Street Talk outside the Capitol! The Maine group (except for Bob and Doris who were earlier risers). 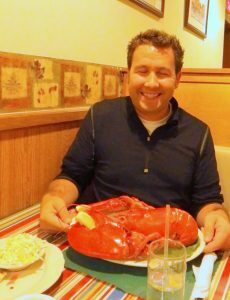 Ryan had never had lobster and even though it was Labor Day, Sully's in Winthrop was open and serving the biggest, most delicious lobsters we'd ever had. Ryan was skeptical at first, but he dug right in! 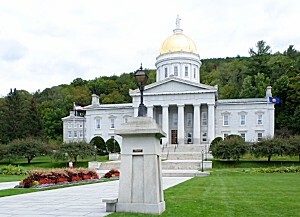 9/4/13 - Montpelier was a charming town and the Capitol grounds were beautiful. The Wicklines joined our troupe in Montpelier to help with Street Talk at the capitol. 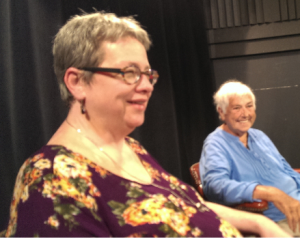 Betty Keller (no relation to Julie) had Laurie, Terry and Sue on her cable TV show, We're All In This Together, with Peg Franzen of the Vermont Workers Center. Albany was our next stop. We did some filming of Street Talk in the noisy downtown area and then proceeded to The Linda, run professionally by Graeme McKenna. 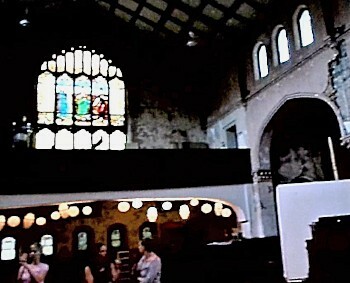 It was a wonderful venue and a good audience. Unfortunately, Sue and Donna completely missed the screening in Philadelphia due to getting lost via a dysfunctional Garmin device. 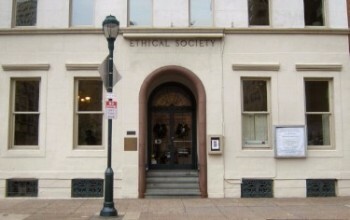 However, everyone was present at the Ethical Society the next morning, where Kay Lasker, dedicated Pennsylvania advocate, joined us. We also met Lynn O'Connor and her husband Gerry, still steadfast DUH friends today, and did Street Talk in a lovely park. 9/9/13 - It was a long drive from Baltimore to Columbus, Ohio, but well worth it! 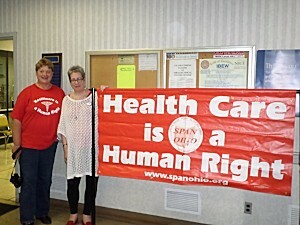 Kurt Bateman and SPAN Ohio's Debbie Silverstein had arranged for the screening to be held in the IBEW union hall in Columbus. 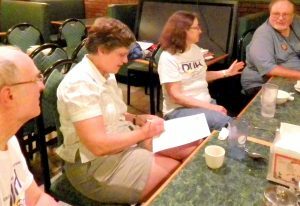 There were several SPAN Ohio members there, as well as union members and the discussion was lively! The next morning Kurt and Debbie took us to breakfast and great conversation! During the drive from Ohio to Chicago, Bob's car had a flat tire, but he and Doris were fine and made it to Chicago in time. 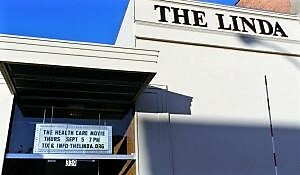 9/10/13 - Sue had chosen the South Side's Little Black Pearl, a community cultural center, for the screening in Chicago. We all hoped that the diverse population of the neighborhood - African American, Latino, and Asian - would be interested in attending. Unfortunately, that hope was not fulfilled, but we had a good audience anyway. Almost Sue's entire family was present for the screening at the public library. And, yes, they all got free t-shirts! For Sue, who had 10 years of touring experience around the world with Hubbard Street Dance Chicago, this should have been a walk in the park...but she was almost 30 years younger then! It was a great tour, but we all were glad to see our lives return to "normal" with no hurried drives, uncertain sleeping conditions, unexpected technical difficulties (but thankfully, no "wardrobe malfunctions"), who knows what to eat, and the possibility of a hostile audience (which never happened on any of our tours). And we were evidently more successful than we may have imagined. Invitations had already started to come in from the West Coast by the time we got home. Seven months later we would be starting in San Diego and traveling the length of California, into Oregon and Washington to Seattle. Read on for the West Coast Tour!